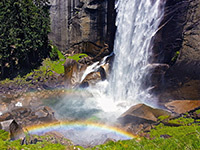 Hikes in Yosemite Valley range from the paved, 0.25 mile Bridalveil Falls Trail to strenuous climbs of over 4,000 feet into the granite wilderness that makes up most of the national park. Many of the trails meet other backcountry routes, so allowing for multi-day backpacking trips, though walking just a short distance along the longer paths can still be rewarding. The Yosemite Valley Hiking Map shows the location of each trail. Other Yosemite trails: Glacier Point Road, Mariposa Grove and Wawona, Tuolumne Meadows and Tioga Road. Bridalveil Falls 0.25 80 The short, paved path through woodland to the base of 620 foot high Bridalveil Falls begins at a parking area 2 miles east of the Wawona Tunnel on the Southside Drive. 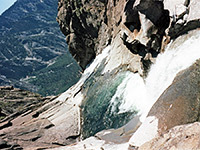 In summer the amount of water is small, but still usually enough to envelop the end of the route with spray and make the granite boulders beneath the waterfall quite slippery. Cook's Meadow 1 (loop) level The open spaces of Cook's Meadow provide a good, unobstructed viewing area of the cliffs rising high above Yosemite Valley. A wheelchair-accessible path loops around the edge of the grassland, between the visitor center and Sentinel Bridge over the Merced River. Eagle Peak 3 1,325 Eagle Peak is a prominent summit on the north side of Yosemite Valley, reached by a continuation path at the end of the 3.5 mile trail to the top of Upper Yosemite Falls, so the hike from the valley floor is a testing 13 mile round trip with an elevation gain of nearly 4,000 feet. 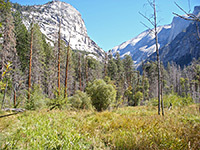 Once above the falls, the upwards gradient is more gentle as the path follows Yosemite Creek northwards then turns back south, over several marshy meadows and ending with a short steeper climb to the peak. Four Mile 4.8 3,240 One of two steep paths that climb the south side of Yosemite Valley to Glacier Point, the Four Mile Trail ascends the side of a ravine between Sentinel Rock and Moran Point, for superb views up and down the valley, and of Yosemite Falls opposite. The trailhead is on the Southside Drive near the bridge over Sentinel Creek, and the upper end is the parking area at the end of the Glacier Point Road, which, like the trail, is closed in winter. The round trip makes for a moderate day hike, though an easier option is to do the hike one-way (downhill), with either a car shuttle or using a tour bus (a 2 hour journey) to drive to Glacier Point. 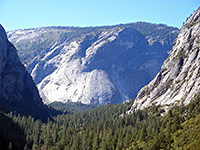 An intermediate overlook (Union Point) is reached after 3 miles, and one continuation is to use the east end of the Pohono Trail to reach 8,122 foot Sentinel Dome. As the lower part of the Four Mile Trail is through woodland and the cliffs face north, it receives limited direct sun and is often quite damp - conditions which attract a lot of mosquitoes. Half Dome 2 1,820 The shortest route to Yosemite's most famous summit is along the John Muir and Mist Trails for 5 miles, to a junction at 7,000 feet a little way above the valley of Sunrise Creek, then the Half Dome Trail for the final 2 miles to the top - a total elevation gain of 4,800 feet. Using only the John Muir Trail at the beginning adds 1.2 miles though it is slightly less steep and avoids the wet, slippery section around Vernal Fall. Most of the final 2 miles to the summit is a standard, albeit steep, climb up a shady, forested hillside but the last part across the 45° granite face of the mountain is much more testing, and only possible because of 400 feet of parallel steel cables installed by the NPS along the steepest part. Despite this, and the overall strenuous nature of the hike, the trip is becoming increasingly popular, causing quite lengthy delays on summer weekends as people wait to ascend the cables. As an alternative, the 15 mile round trip to the next summit east (Clouds Rest, starting from Tenaya Lake on the Tioga Road), has better views, similar scenery, far fewer people, and no cables. John Muir 208 One of the longer paths in California, the John Muir Trail links Yosemite Valley with Mount Whitney, running for 208 miles through high mountain wilderness of the Sierra Nevadas. Several sections within Yosemite are suitable for day hiking; the first few miles are along the Merced River, and provide a less-used alternative to the Mist Trail for visiting Vernal and Nevada Falls. Two miles above the waterfalls, the route turns northeast along Sunrise Creek and soon passes two junctions with the paths to the granite summits of Half Dome and Clouds Rest. Several other paths branch off as the main trail climbs past the slopes of Surprise Mountain to a high point of 9,700 feet at Cathedral Pass, then descends fairly gently to highway CA 190 through Tuolumne Meadows. Lower Yosemite Fall 0.5 50 Probably the most used path in the park is the easy walk to the base of Lower Yosemite Fall, starting by the Northside Drive near Yosemite Lodge (shuttle stop number 6). Although the falls often dry up completely by late summer, the cascade is usually an impressive site all year round, causing the area around the base to be covered by spray. Mirror Lake 0.8 100 In the lower end of Tenaya Canyon, Mirror Lake is a shallow pond gradually becoming a marshy meadow, and a good place both for spotting wildlife and photographing reflections of the cliffs at either side, including Half Dome, though as with some other water features, it is dry during summer. A paved route (an old service road) leads to the lake, starting from shuttlebus stop number 17 at the east end of the valley drive. Mirror Meadow 3 (loop) 140 The path to Mirror Meadow is an extension of that to Mirror Lake. It starts near the end of the old road to the lake, crosses to the south side of Tenaya Creek then follows the stream through woods and patches of meadowland, passing right beneath Half Dome. After 1.5 miles, not far below the point where Tenaya Canyon starts to gain height quite steeply, the path crosses the creek a second time and returns to the trailhead along the north side, passing a junction with the Snow Creek Trail. Three different trails run alongside the Mirror Lake Road to provide alternative routes back to the main road. Mist The Mist Trail is the main way to see beautiful Vernal and Nevada falls, two of the most popular attractions of Yosemite Valley. The first part of the route is along the John Muir Trail, following the north side of the Merced River, starting from the Happy Isles Bridge at the far end of the paved road. The Mist Trail forks off left soon after a footbridge over the river, from where Vernal Fall can first be glimpsed, at the head of a short ravine. The path approaches quite close to the base then climbs very steeply to the top via over 600 steps cut into the granite cliffs. The next half mile is a much gentler ascent through woodland before another rise to the top of Nevada Fall, and a second junction with the John Muir Trail. North Dome 5 950 Rivaling Half Dome as the site of the best views over Yosemite Valley, the summit of North Dome can be reached by a hike of 8.5 miles and a climb of 3,550 feet - the first, strenuous part is along the Yosemite Falls Trail to the top of the upper falls, from where the North Dome Trail branches east, climbing to Yosemite Point, turning away from the cliffs and passing over Indian, Lehamite & Royal Arch Creeks then bending back southwards to the summit. This point can also be reached from the Tioga Road - the North Dome Trail continues for 4 more miles and meets the highway a mile east of the Porcupine Flat Campground. Pohono 13 2,800 This long and little used trail climbs to the top of the cliffs on the south side of Yosemite Valley and follows close to the rim all the way from above the Wawona Tunnel to Glacier Point, mostly through the forest though passing many viewpoints of the valley. The west trailhead is at the parking area on the east side of the tunnel, from where the path ascends 1,500 feet steeply with many switchbacks then turns east and climbs more gently, soon passing four viewpoints in fairly quick succession (Old Inspiration, Stanford, Crocker and Dewey), before turning away again into the woods, curving around several upper tributaries of Bridalveil Creek then on to one more overlook at Taft Point. The final section is past Sentinel Dome (the actual summit is reached by a short spur trail) and on to the parking area at the end of the Glacier Point road. Along the route are junctions with two connecting paths from the road, leading to Taft Point and McGurk Meadow, so allowing for various shorter hikes - see the trail listings for the Glacier Point Road. Snow Creek 5 4,460 The steepest of the 5 trails that climb from Yosemite Valley is the route up Snow Creek, a tributary of Tenaya Creek that in spring forms an whitewater cascade around 2,000 feet high. The trail begins near the far side of the Mirror Meadow Loop, and reaches the Tioga Road after 5 miles, continuing on the far side to May Lake after another 3 miles. The path from the valley is steep from the start and quite exposed, passing over south-facing, rocky, treeless slopes and rising 2,400 feet in less then 2 miles, but once at the top, the remainder is a gentle walk through the pine woods, beside the creek for a while then rising some way above it. The spectacular waterfall is not in view from the trail but can be seen by scrambling around the cliffs for a short distance. Valley Floor Loop 13 (loop) 200 The Valley Floor Trail provides a quieter way to tour Yosemite Valley; close to but mostly out of sight of the main roads, this follows the north and south sides of the Merced River, from Pohono Bridge in the west to Yosemite & Curry villages in the east. The route is through alternating woodland and meadows, with frequent views of the river and the granite cliffs above. Half way along the valley, the El Capitan roadbridge allows the east or west sections to be hiked separately (these are known, respectively, as the Center Valley Loop and the Bridalveil Loop), though most people just walk a short distance along part of the route. The path south of the river links Bridalveil Falls, Sentinel Creek and the Four Mile Trail, while the north side runs past Yosemite Creek and its Lower Falls, beneath Eagle Peak, El Capitan and Ribbon Falls, to Bridalveil Meadow. Yosemite Falls 3.6 2,600 Beginning at the Sunnyside Campground/Camp 4 (shuttle stop 7), this strenuous but well used path climbs the cliffs at the north side of Yosemite Valley, passing over 100 switchbacks, to the top of the highest waterfall in North America. Above the falls is a junction; right is the North Dome Trail, left is the Eagle Peak Trail.